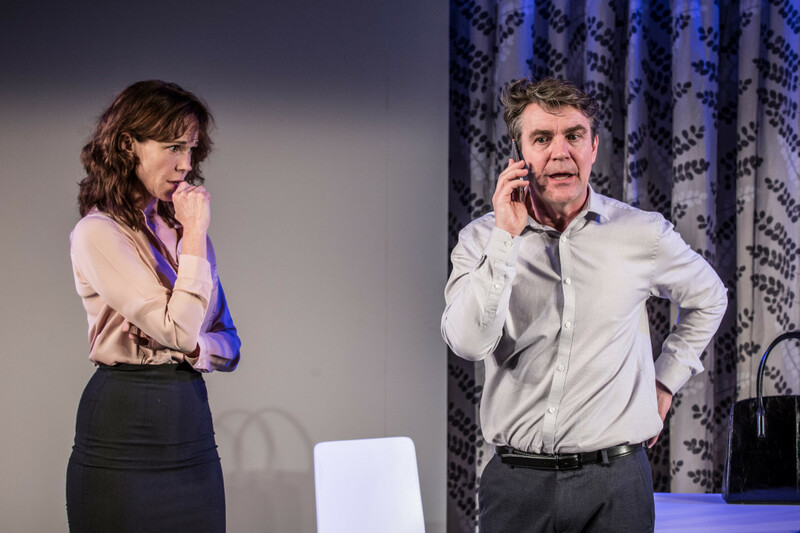 Having scored walloping successes with The Father and The Mother, Florian Zeller’s The Truth, once again adapted by Christopher Hampton, comes as light, comic relief although its subject of marital infidelity can be as much tragedy as comedy. But then, where would French farce be without adultery and The Truth is nothing if not a clever little whiz round the gallic national sport of taking a mistress. Doffing his hat very much at Pinter, as usual with Zeller, it’s not so much an exercise in deceit as an exploration in shape-shifting reality. What you see is not necessarily what you think you see. 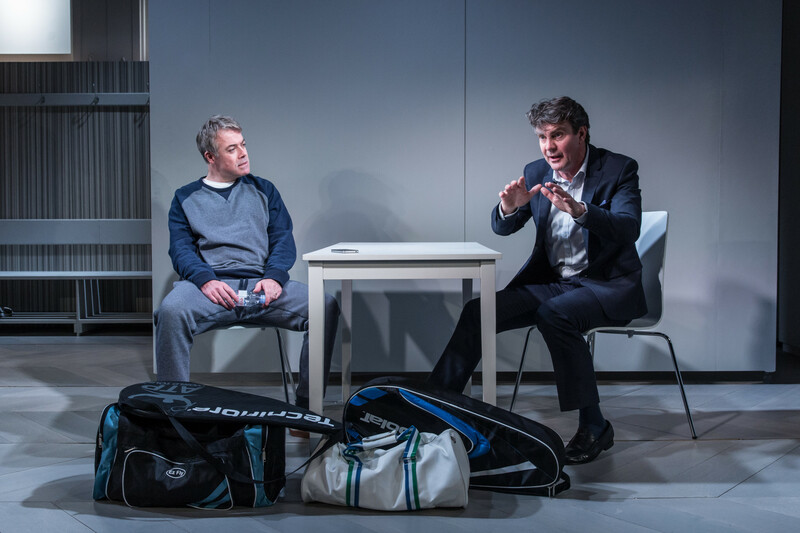 It’s like watching an extremely elegant game of tennis – a pastime that Alexander Hanson’s Michel enjoys frequently with best friend Paul – except that whilst one of the players thinks he’s playing singles in fact he’s in a foursome! Hanson is exquisite as the self-deluding Michel whose moral compass is so skewed that even after exposure guilt sits on him less heavily than outrage at the crimes he feels committed by others, on him, especially his best friend. As with Pinter, male loyalty finds a deeper bond than wife and mistress. To see Hanson squirming and pitching as one lie after another pours from his lips with the equanimity of the born scoundrel is to watch a master-class of comic timing. 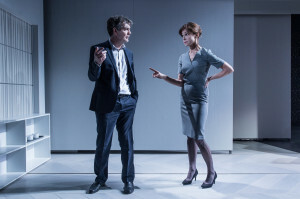 So too Portal’s totally inscrutable Paul, making `what’ sound like a whole argument in itself whilst Frances O’Connor as Paul’s wife and Tanya Franks as the seemingly guiltless Laurence, Michel’s unfortunate wife add lustre and affront in equal measure. 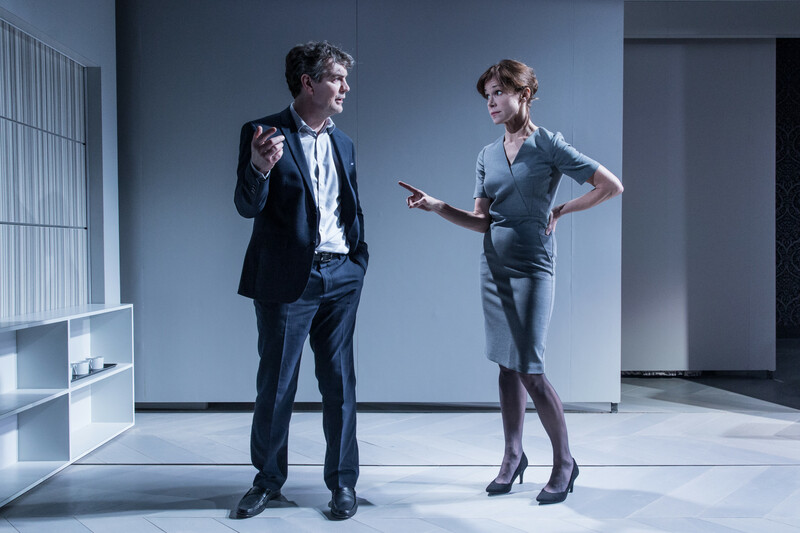 Lindsay Posner directs this farrago of untruths with a sure touch and series of sliding doors. One of its major joys is seeing where Zeller differs from Pinter with such similar material. For Pinter, language is a weapon; for Zeller, a tool for exposing human nature – and the truth in any given situation – to be as slippery as an eel. Only in a French comedy would you find truth-telling described by a character, aka Michel, as selfish and hurtful – words Zeller ensures rebounds back on him in a surprisingly unforeseen way. Sophisticated fare and entertaining with it. A Menier Chocolate Factory, Theatre Royal Bath co-production.